This is the second novel I've read that draws on Robert Browning's poem My Last Duchess, focusing on a couple from centuries gone by that we really know very little about. The blurb of this novel is "passionate love story". The truth of it is bittersweet, monotonous and oppressive. The everlasting cloud of doom hovers over Lucrezia de Medici as she makes one youthful mistake after the other during her tragic marriage to Alfonse II, the Duke of Ferrara. What should be a marriage of wealth and status is simply a stifling prison for Lucrezia, as she cannot deliver a very important thing for the demanding Duke: an heir. This is not entirely Lucrezia's fault though. The virile Duke is unmanned by Lucrezia's purity and youthfulness, and a year and a half of unsuccessful consummation leaves Lucrezia utterly bored. With devastating consequences, Lucrezia decides to sow her wild oats with a local artist, Jacomo. He is one of the more intriguing secondary characters of the story, as the two main protagonists are predictable and selfish, and therefore not very likable. The crux of the story centers around the inadequacies in the marriage, but the storyline finally picks up during the last quarter once the Duke's diabolical plan to rid himself of his Duchess comes to the forefront. The supporting cast of characters helped build the story up to a climatic end, with Lucrezia receiving help from unexpected places. The creative ending made up for the repetitive start, and readers would like the intrigue that suddenly spills over. 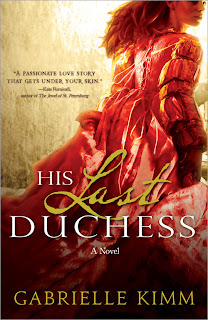 A fitting sequel to this story would be Elizabeth Loupas' The Second Duchess, which covers the story of the Duke's second marriage to Barbara of Austria but also features Lucrezia. The author Gabrielle Kimm is working on her newest novel that features the Duke's mistress, Francesca.